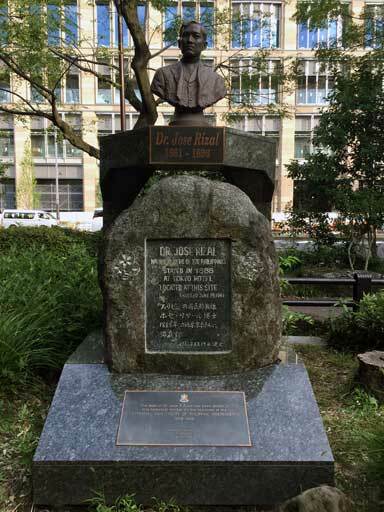 The statue of Dr. Jose Rizal is built in Hibiya Park in Tokyo. It is a memorial that he came to Japan in 1888 and stayed at a nearby hotel. Well, the other day, the event “Philippine Festival 2017” was held at that Hibiya Park. 90% of the visitors are Filipino residents in Japan. The event is exciting with singing, dancing and parades by Filipino entertainers. I heard that Rizal is a hero of the revolution and a historic great man for Filipinos. So I thought that many visitors would do a commemorative photograph in front of his statue. However, most people did not care. I felt a little unexpected. You guys are not interested in the monument of your hero who stands in a foreign land? But later, when I asked an acquaintance Filipino about that, she said “Because we are familiar with his monuments, we are more interested in Japanese-style things.” I see.